I hope today finds you happy, healthy, and full of hope and good cheer for the new year ahead. This day tugs at my heartstrings, y’all. Christmas Eve and the kids are wired for sound. Perpetual motion. A blur of constant motion like a toddler hyped up on a double double*. Their excitement is contagious. In a year I suspected one would start questioning Santa, we got lucky. He brought it up once. I denied it. He let it go. I’ve got another post coming about that. *A double double is a coffee with 2 cream and 2 sugar for those of you were curious but too shy to ask. The boys were super excited to see Woody and Elfis in our hotel room yesterday and today. They really wanted us to, without touching them of course, put them in our suitcase so they could come home with us. Crash was worried. He did NOT want to leave them behind. But we did. You can now imagine how excited he was to hear his little brother shout, “I found them!” from atop the stairs when we got home. There they were, perched comfortably in the stockings hanging on the boys bedroom doors. Folks, I don’t know how they did it. We checked into our hotel and met DW’s cousin for supper. 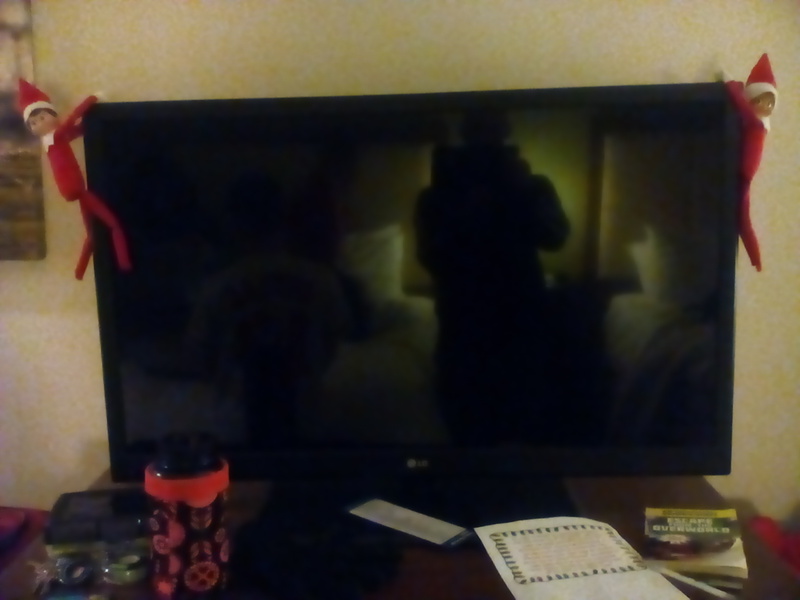 Upon our return who do we see hanging from the TV in our hotel room? It may be the first day of winter, but it’s also my Mom’s birthday! Happy birthday Mom! She also goes by the name Nana. Of course they LOVE to read! So do we. Crash already has his book picked out for our road trip tomorrow. He doesn’t have clothes picked yet, but by God he knows what he’s going to read. And Bang wants to write more stories. I love these kids! Ask me again tomorrow after being in the truck for three hours with them. Anyway, here are our elves “hiding”. Back on the second day of this month I wrote about a different kind of Advent Calendar. Essentially, instead of doing a Christmas count down with a tiny piece of chocolate each morning, we are doing a random act of kindness for each day leading up to Christmas. Tomorrow we’ll be on the road travelling for an over-nighter. Crash has yet another oral consult to find out what can be done about his front tooth that has come in pointing towards the back of his mouth. Braces? Surgery? Something else entirely? While we are at the hospital on Wednesday we will “candy cane bomb” as many cars as we can (64 since that’s how many candy canes we have). Each on has a Merry Christmas message taped to it and we’ll leave them randomly under windshields. Then on Thursday we’ll leave money in vending machines so that when people go get a treat or drink they’ll find it’s already paid for. Upon our return we will only have 2 more Random Acts of Kindness or, as Bang calls it, Random Actness Kindness before Christmas morning. It is far better to give than it is to receive. Bang took to it like a reindeer to flight. He was eager to help. If you could have seen him during the event where we helped serve 250 senior citizens turkey supper you would have seen him serving plates of food and later handing dishes over to be washed. While Crashed joined us and was eager to help he would still ask, “Do we get anything for helping?” No. You get thanked. But it’s hard when you’re 9, I guess. To his credit, we have caught him doing more for others. Holding doors, helping others when he can, and attempting to think of others first. He’s made “gingerbread men” for the doctor(s) we’ll see tomorrow by drawing people on brown cardboard and coloring them. So we take our wins where we can. Perhaps he is learning after all. I’ve got no post today. Instead of just writing something for sake of publishing, I’ll wait until tomorrow. I’ll write tomorrow and let you know how our daily Random Act of Kindness is going. Or as Bang calls it “Random Actness Kindness”. For now I’ll just update you on the elves. Don’t forget to move yours! The elves were busy last night. Not only did they move to their new spot on the closet doors after returning from the North Pole…. When I checked my email this morning there was a message there from YouTube asking if I was ready to publish my video. HUH? I didn’t record anything. Today they tested their physical prowess. Perhaps they’re training for the next American Ninja Warrior? Or perhaps they’re slack lining or tight rope walking over Niagara Falls. Whatever they are training for they are training for it in our kitchen. They wrote back, “We’re okay.” so all was good.